The release from Cannonsville is 1,500 cfs with 85 cfs still spilling over the top of the dam. The flows are still dropping throughout the system. There is no real rain in the forecast so we should see all of the rivers continue to drop over the next few days. The releases will likely remain high for a while to drop the reservoir levels. A lot of people are throwing streamers but we’re seeing more fish rise as the water drops. Mostly blue wing olives with a few isonychias mixed in. Today looks like another day in the 70’s with some sun and clouds mixed. Winds will stay under 10 mph from the South. The flows are dropping nicely and the rivers look good this morning. The release from Cannonsville is still 1,500 and will probably stay there until the reservoir levels drop a bit. The flow at Hale Eddy is 2,370 and dropping slowly as the feeder stream flows drop. The cold releases and cooler nights have helped the water temps throughout the system. We should be in the 70’s with a bit of sun today but the night temps are dropping back into the 50’s. There’s no appreciable rain in the forecast so we should continue to see the river flows drop over the next few days. We’ve been finding quite a few olives on the West Branch mixed with a few isonychias. Streamers have worked well in the higher flows. The river dropped quite a bit over the last 24 hours but both reservoirs are still spilling. The Cannonsville spill is hot at Stilesville until it mixes with the colder release and runoff and cools down to 60 degrees at Hale Eddy. The release from from Cannonsville is 1,500 cfs. There is 1,211 cfs spilling. Give it a few days for the runoff and spill to subside a bit more. The Beaverkill flow has dropped under 1,000 cfs and the temp looks good at Cooks Falls. There is a chance of rain this morning but the amount looks negligible. We have a chance of seeing a little over 1/4″ overnight, followed by a little rain tomorrow. After that we should be dry through Sunday. Both Cannonsville and Pepacton Reservoirs are spilling. The Cannonsville spill is hot at Stilesville until it mixes with the colder release and runoff and cools down to 61 degrees at Hale Eddy. The river is clearing up and there is no rain in the forecast today. We do have 1/4″ in the forecast tomorrow but the rest of the week looks clear. Give it a few days for the runoff and spill to subside. If you do come today check the water temps, be in a boat, and make sure whoever is rowing knows what they’re doing. Part of the Iron fly and Get Trashed Crew. The water is high throughout the system this morning. It’s going to take a few days to calm down and get back to fishable levels. For safety take a couple days off from fishing up here and let the water levels drop a bit. We were hit with some decent rain yesterday and Cannonsville Reservoir is spilling. So far about half the flow at Stilesville is warm spill and the other half is cold release. The Stilesville temp is way up at 70 degrees, but the runoff below seems to be colder and is keeping the water temp in check at Hale Eddy. The air temp will be cool today around 70 degrees and we should keep the cloud cover. That’s good news for the water temps. If you are out there check the water temps with a thermometer before you fish. The Beaverkill at Cooks Falls is 62 degrees today which is a great change from the last few weeks. All of the rivers in the system are up. We have no real rain in the forecast for the next couple of days so hopefully that gives the system a chance to come back down. 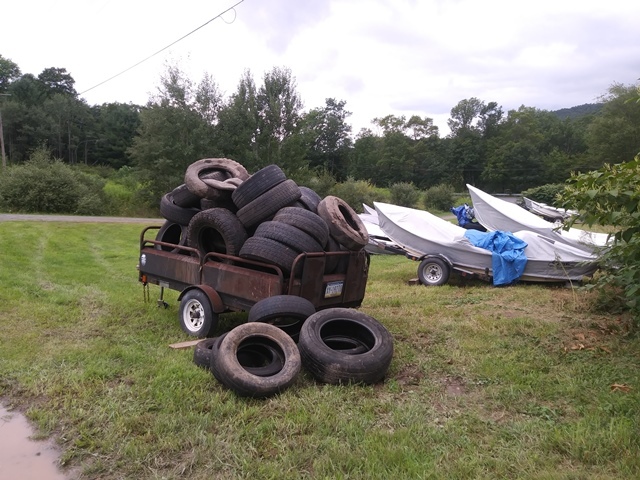 Despite the high water the Get Trahed crew got 55 tires and over a dumpster worth of trash out of the system yesterday! We were hit with more storms this morning. Stilesville only jumped to 1,530 cfs but Hale is at 3,380 cfs and climbing. The lower West is off color. We were hit with some good storms overnight. The flows have jumped on most of the system below the feeder creeks. The flow at Stilesville is level at 1,510 cfs. The flows are dropping this morning as the runoff subsides. We may see some additional rain this morning. The forecast shows 50% of some scattered storms coming through around 11 am. If all the storms miss us through noon we should be in the clear. The water is moving throughout the system so be careful if you fish today. The West Branch at Stilesville is 1,510 cfs. Most of the flow is coming from the feeder streams. We are off color with the runoff. Hopefully the rest of the rain misses us and we’ll begin to drop and begin to clear this afternoon. Yesterday was another sunny, warm day. The West Branch looks good this morning with decent clarity. The water temp at 191 Bridge is 54 degrees this morning. There is rain in the forecast this afternoon. A few showers this morning followed by scattered thunderstorms this afternoon. We may see 1/2″ throughout the day but that depends on how scattered the storms really are. 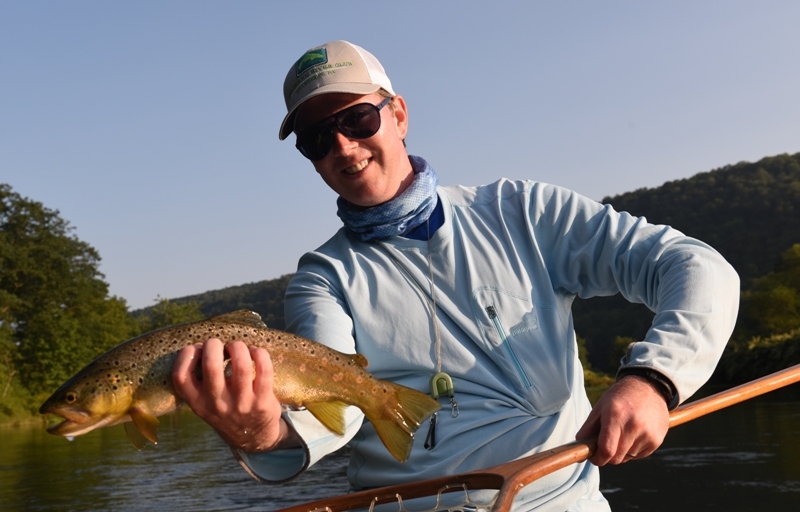 Sulphurs, isonychias, and olives will your best bets for dry fly fishing today. 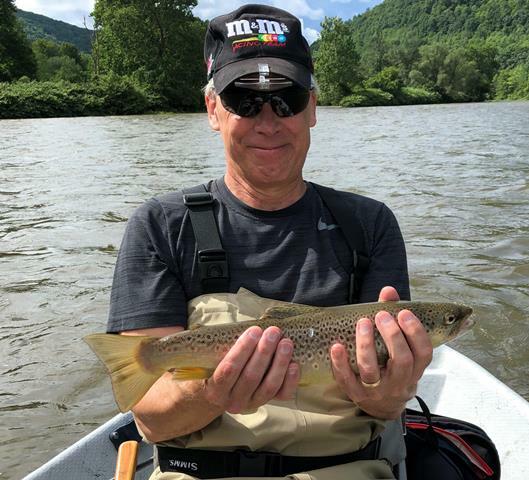 Streamers are still a great bet in the higher water. You may smell a little diesel in places below Hale Eddy but for the most part it’s hard to tell there was a problem. Slow edges with vegetation close to the river may have some remnants. The high water flushed most of it out of our area right away. We got lucky. The East Branch has cooled a little as the warm runoff subsides and a greater percentage of the flow is release. Harvard is still starting off at 65 degrees though. We’d like to see it drop even more before we go over there to fish it. Wunderground was correct and it really was mid 80’s and sunny yesterday. Usually we’d be looking for cloud cover but the sun was a welcomed change. The creeks are still high but the West Branch is dropping. The West is clear from the dam down to Oquaga Creek. The water is off color below that but is clearing as the flow drops. It is clear enough that fish will rise if there is a hatch. We are still fishing sulphurs, olives, and isonychias in Deposit. It’s mostly olives and a few isonychias on the lower section. We did see some flying ants in the yard last night but not on the water yet. Definitely have those in your box now. We should see more sunshine today with a high in the low 80’s again. 5 mph winds from the North. Very similar to yesterday. The spill from Pepacton Dam is warm so do not fish the East Branch for trout. Harvard is close to 70 degrees this morning and peaked around 74 yesterday. There is no rain in the forecast today. We should see 83 degrees, sunshine, and winds from the north around 10 mph. The rivers were rising yesterday from runoff and the lower West seemed to get more off color as the day went on. Streamer fishing was your best option by late afternoon. The sulphurs and isonychias are still hatching on the upper West Branch. The West Branch at Hale Eddy flow is just beginning to drop this morning. If you want to fish dry files stay above Oquaga Creek on the upper West Branch. Streamer fishing below that although you may get lucky and find some rising fish so bring a dry fly rod too. Avoid fishing the East Branch. The spill from Pepacton Dam is coming over hot and it is 70 degrees at Harvard this morning. Fishs Eddy is 67 degrees this morning. We have not smelled any diesel out front in days and people are fishing the West. The combination of high water and rain sent most of it down river quickly and diluted it. Most of yesterday’s rain skirted around us. We did have a bit fall overnight that brought the rivers up but they are already dropping back this morning. There is some color in the West Branch but it is fishable. Stilesville is a steady 1,490 and should be clear above Oquaga Creek. It looks like a good morning to throw streamers and then switch to dries in the afternoon. Sulphurs, olives, and isonychias should cover the majority of the bugs. There are some caddis and yellow sallies around in fewer numbers. We’re hearing there are a couple of areas you can still smell diesel on the Route 17 side of the river near Hale Eddy. We haven’t seen any evidence of any diesel for a few days in Home Pool. People are fishing the length of the river. We should see some thunderstorms today with somewhere between 1/4″ and 1/2″ of rain falling – probably. The storms have been spotty and hard to predict. Keep an eye on the radar for the latest info. Yesterday Wunderground changed the forecast every hour. There is no diesel smell out front and people were fishing the lower West yesterday. If you do find any along an eddy or on the bank call DEC or National Park Service.Most of the rain in yesterday’s forecast missed us. We had a few brief, light showers that didn’t do much to the rivers. The flows are still dropping this morning. There are more caddis on the door this morning and some small stoneflies. Blind casting isonychias in the riffles has worked down here too. There are still mid day sulphurs in Deposit along with some olives and isonychias. The lower West should get cooler as the runoff subsides and the release makes up a larger part of the flow. Today’s forecast calls for the possibility of thunderstorms with a little more than 1/4″ possible. We can’t smell any diesel on the lower West Branch this morning. It sounds like the trains have been removed from the water. Just about every state and federal agency you could think of are here monitoring the river. So far the reports sound good. We are still finding good numbers of olives on the door in the morning. A little more rain fell over night bringing the flows up slightly. The rivers are already dropping back to normal levels this morning. The West Branch at Stilesville is steady at 1,490 cfs while the East Branch at Downsville is 1,220 cfs. The sulphurs are still hatching on the upper river with some olives and isonychias mixed in. We are finding more olives than anything else on the lower West. The sun is breaking through this morning but there is .13″ precipitation in today’s forecast- that should just give us good afternoon cloud cover.